If there ever were a more eye-catching accent piece, we're just not sure what it is. Crafted with care in an array of inviting colors, the Hunter Daybed adds a touch of low-key luxury to all kinds of contemporary areas. 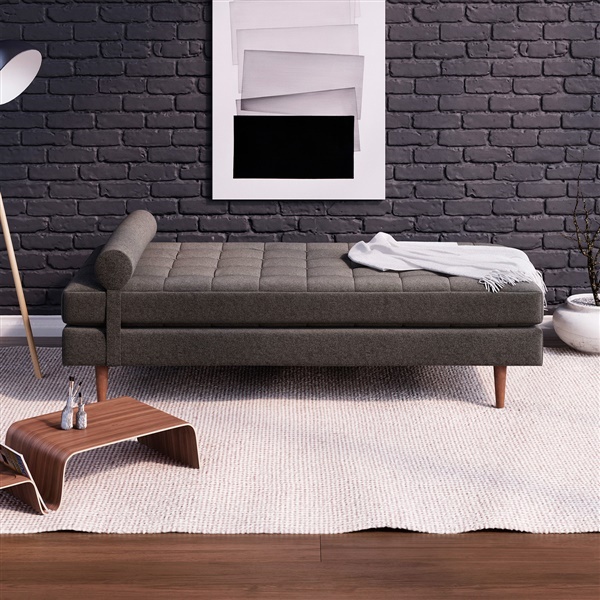 Serving as everyday seating or as a cozy sleeping option for overnights guests, the Hunter Daybed incorporates with ease into all manner of modern areas. Your choice of eye-catching or neutral colors. Expertly bench-made by skilled craftsman..
Can be used for seating or as an extra bed. Memory foam layer sits on top of padded cushions for maximum comfort. Is the bolster pillow removable? Can a twin sheet tuck u see the top cushion? The bolster pillow on the Hunter Daybed is removable. While a sheet can be tucked slightly under the top cushion, the Hunter Daybed does not have the same dimensions as a twin sheet. The Hunter Daybed cushion has the dimensions of 72" w x 28" d, while a standard twin mattress has dimensions of 75" w x 39" d.
Can the top cushion be flipped over (in case of a stain)? Or is it attached to the base? The top cushion is attached to the daybed and is not removable. The finish shown in the main thumbnail image is Charcoal Grey.